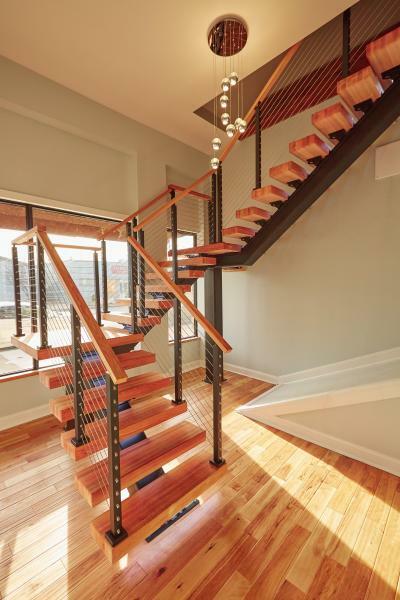 Stair and railing manufacturer Viewrail has introduced a floating stair system in which wood treads are installed on a single steel tube. Flight consists of 3-inch-thick wood treads that are anchored to 6 inch by 8 inch mono-stringer in the center, eliminating the need for risers or connections to the wall. The effect is a stair system that appears to be “hovering over a slender base,” the company says. The effect is a minimal and modern wood staircase with installation flexibility. Viewrail offers 20 solid wood options and steel components in 18 powder-coat finishes. Stairs can be built in either straight, 90-degree turn, and switchback configurations. The stairs can be paired with the company’s stainless steel rod or cable railing. Flight systems are custom designed and made to order and the pre-manufactured stairs come ready for installation and require no onsite welding or cutting. Installation can be completed in less than one day, the company claims. All stair components are tested before shipping. As a contractor, I've seen many of handrails that were completed with Viewrail products and they end up looking great! We recently switched over to using LuxlineMaterials.com due to cheaper pricing and they give us the ability to customize every part if we want. Viewrail was always a great company to do business with though.